A week into NFL free agency, the Vikings were busy re-signing their own talent with only one external free-agent signing, defensive tackle Shamar Stephen, who was drafted by Minnesota in 2014. Could the Vikings still make a splash, like trading from a deep cornerback position, to fill needs? That question and more get addressed in a new Twitter mailbag. Listen: Check out the Access Vikings podcast (also available on iTunes). What do you think we could get for Rhodes in a trade? AK: It’s been a while since a 27-year-old Darrelle Revis was traded from New York to Tampa Bay for a first-round pick and a conditional pick in 2013. By then, Revis was already a three-time All-Pro pick. 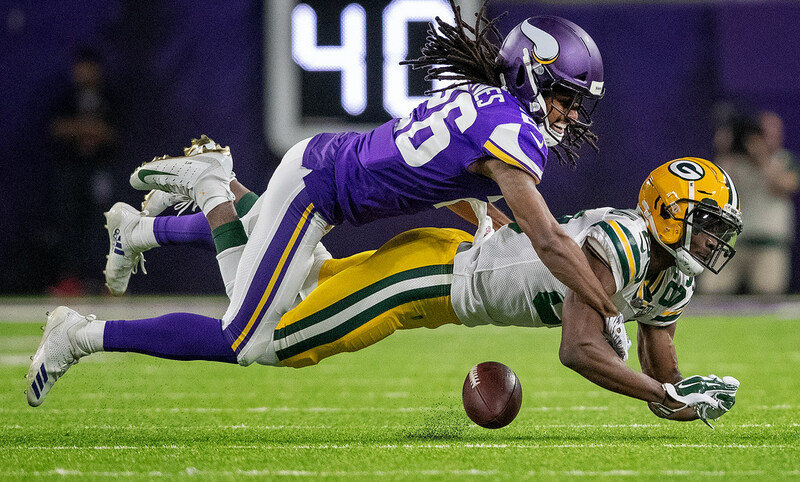 Rick Spielman would be lucky to get a top pick for either starting cornerback Xavier Rhodes (29 in June) or Trae Waynes (27 in July), neither quite at Revis’ level. Really, it makes more sense to move Waynes. Not only is he younger and requiring a new contract after this season, he would clear more cap space — more than $9 million — in a trade than Rhodes (~$6 million). Neither are getting cut as both have base salaries fully guaranteed. Gauging their value on the open market is tough and depends on a team desperate enough to give the Vikings a price they’d accept for one of Mike Zimmer’s key players. One possible suitor, the Chiefs, just signed Bashaud Breeland to a one-yer deal reportedly worth up to $5 million. The Colts and their NFL-high cap space could be a landing spot for Waynes. But would they part with a promising offensive lineman or, let’s say, a third-round pick? What chance do you think the Vikings will have an adequate o-line this year after most of our D has been resigned?…field goal kicker? AK: There’s still a chance depending on their urgency to address it in the NFL Draft and the ensuing development this summer. Two starting O-line jobs still need to be filled and recent contracts, like re-signing RB/KR Ameer Abdullah and K Dan Bailey, make clear the Vikings are in buy-low mode. They could find an option in veteran Josh Kline, the ex-Patriots guard, but he’s touring the league to find the best deal. There are more free-agent options at a bargain, but the NFL Draft increasingly becomes the focus. Just nine linemen are currently under contract; the Vikings took 16 into camp last summer. So, they’ll add more bodies through free agency, the draft and undrafted free agency. Any chance Vikes draft a better center than Elflein. Then move Elflein to guard? AK: This is pure speculation, but I think the Vikings may keep Pat Elflein at center unless a player (N.C. State’s Garrett Bradbury?) is rated too highly to surpass with the 18th pick in April. I was surprised they weren’t willing to reach the Panthers’ three-year, $27 million deal for center Matt Paradis and let Anthony Barr walk, but perhaps their sights are set on addressing the O-line hard in the draft and/or trades. They’d be wise to keep an open mind at this point, with two holes in the lineup. Say a top tackle falls, should they pass up having two long-term bookends in a rookie and second-year Brian O’Neill? Then move Riley Reiff to guard, as the Star Tribune reports they’ve discussed internally. That could mean Elflein stays at center seeking a rebound in 2019. AK: A new contract for Adam Thielen should still be on the table. The two sides would need to come together to reward a receiver who averaged 1,300 yards for $6.5 million, well below market value, the past two seasons. The salary cap should have little to do with it. As the Vikings front office has done with recent deals for Danielle Hunter and Stefon Diggs, the player is kept on their previously scheduled (and cheaper) base salary with new years tacked onto the remaining old contract; then only a prorated bonus affects the cap in the year the new contract was signed. They effectively did that with Anthony Barr, who was a free agent but was signed to just a $2.9 million salary while pocketing a $13 million bonus. He counts only $5.6 million against the cap this season. Theoretically, a new contract for Thielen could lower or maintain his current cap charge ($8.1 million) while putting more money in his pocket now and bigger paydays in the future. Are the Vikings going to run a lot of 3-3-5 on passing downs, with Barr in the role Brian Robison used to have? AK: Listening to Mike Zimmer defend Barr’s role in his system doesn’t make me think he’s open to drastic changes in the way he’s used moving forward. It does sound like they’ll experiment with different wrinkles this offseason featuring two stout run-stopping tackles, Linval Joseph and Shamar Stephen, in the middle. Could that free up pass rushers like Barr to be used differently on first and second downs? It depends on Zimmer’s willingness to relieve Barr of his longstanding coverage assignments. The Vikings’ blitz schemes, including out of a 3-3-5 formation with Barr, Kendricks and Wilson at linebacker, were very effective last season while not being overused. So, it’d be a big change for Barr to become a pure pass rusher, and not contribute much in coverage, as Robison once did.